Q: Should I bring my children to the funeral home and funeral? We encourage parents to bring their children to visitation and funeral services. Death is part of life and children need to understand that at an early age. However, we do offer the convenience of a kids play room so that they can still attend with you but have access to toys and games at the same time. 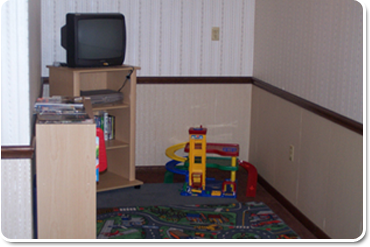 The kids play room is conveniently located on the lower floor of the funeral home. At the Mattera Funeral Home we want you and your family to be as comfortable as possible, that's why we have a kids play area specifically set up for kids to play with toys and watch videos. In the Commonwealth of Pennsylvania, there is no law requiring embalming. However, the remains must be buried or cremated within 24 hours of death. The only exception is when there are religious beliefs against embalming. Q: Are burial vaults required by law? There is no law requiring a burial receptacle or burial vault. However, most cemeteries require a cave proof container that the casket will be buried in. Q: Should I preplan a funeral? Q: I have a pre-arranged funeral, can I transfer it to another funeral home? A recent court ruling in Pennsylvania says that you are not able to transfer to another funeral home. However, any reputable funeral home will voluntarily transfer your account with interest to the funeral home of your choice. Q: What do I do when death occurs away from home? Call your hometown funeral home. They are trained to handle deaths away from home and may be able to save you some costs in bringing your loved one home. Q: What is the cost of a funeral? Costs of a funeral will vary depending upon each individual family's wishes and desires. Under the Federal Trade Commission (FTC) a funeral home must present to you a General Price List, Casket Price List and Burial Receptacle Price List. At the Mattera Funeral Home, we are willing to discuss all costs openly with anyone to meet their wishes and desires for a personalized service. Q: Should we have a traditional funeral or cremation? A traditional funeral helps each family member grieve by viewing the remains of the deceased. It also give the public an opportunity to pay their respects to the family. You can also have a visitation and cremation for a final service. A memorial service is for an individual that has died and was either buried or cremated prior to the funeral service. Q: Where should I buy a casket or burial receptacle or burial vault? Under the FTC rules, you may purchase a casket or burial vault from anyone selling such products. However, your funeral director has the best knowledge of these products and can advise you. Q: Should I buy my casket from a casket store for future use? Q: How can I obtain a certified copy of a death record?